St. Gregory of Nazianzus (c.325-389) wrote three types of work: poetical (including epigrams, epitaphs, and epistles), prose epistles, and orations. Gregory is widely acknowledged to be one of the finest of all Christian orators. His orations were collected in various combinations, and were fairly commonly found in monastic libraries. This manuscript has ownership inscriptions of the Cistercian Abbey of Byland, in Yorkshire. 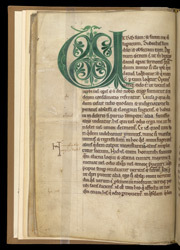 The first oration is introduced by a large green initial 'U', a guide letter for which is visible at the far left edge of the page. The annotation in dark ink in the left margin is a monogram made up of the letters 'N O T A', meaning 'take note! '.